Download "Upon completion of the Medical Assisting program, students will be eligible to take the national certification exam." 1 Medical Assisting Metropolitan Community College s Medical Assisting program is a one-year certification program designed to give students the knowledge and skills to provide administrative and clinical support to healthcare employers, including hospitals, nursing and residential care facilities, and physician offices. One of the fastest growing healthcare occupations today is the medical assistant. A certified medical assistant may be called upon to provide clinical assistance in everything from obtaining patient history and vital signs to vena puncture. In addition, the medical assistant may be called upon to perform administrative/managerial duties such as scheduling appointments and ordering supplies or assisting with the hiring and/or evaluation of employees. Upon completion of the Medical Assisting program, students will be eligible to take the national certification exam. 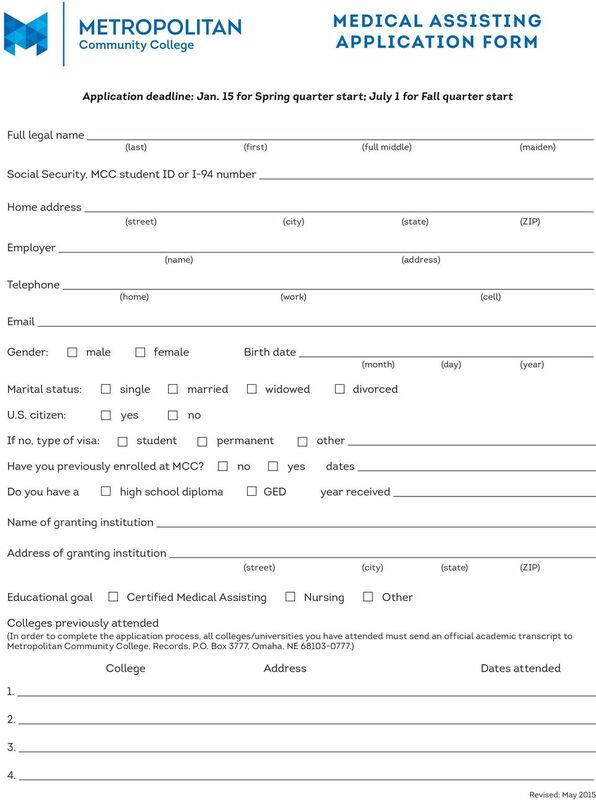 Application deadlines Application deadline Admitted applicants notified Program begins Jan. 15 July 1 End of January Spring quarter Note: The evening classes have daytime externship hours during the fourth quarter. 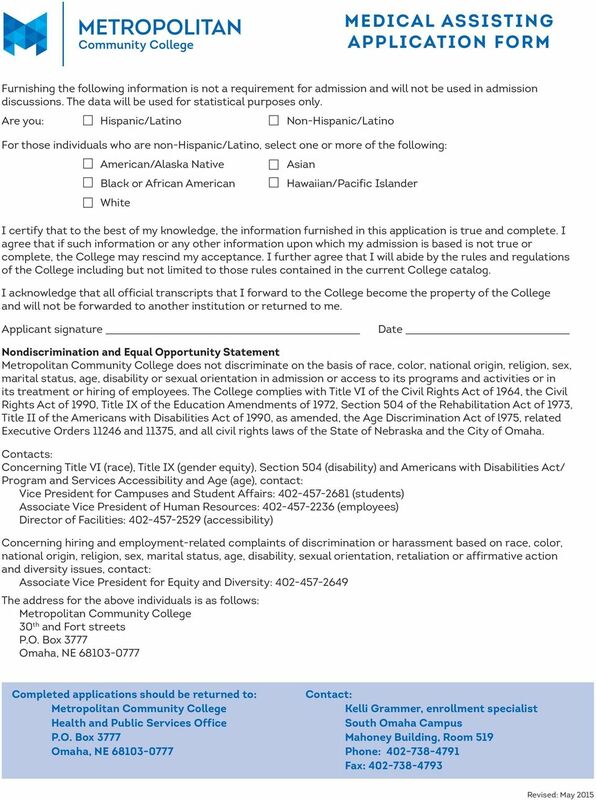 Application information subject to change without notice. Any class that is completed through a CLEP test will receive a grade of C when being evaluated for the Medical Assisting program acceptance. 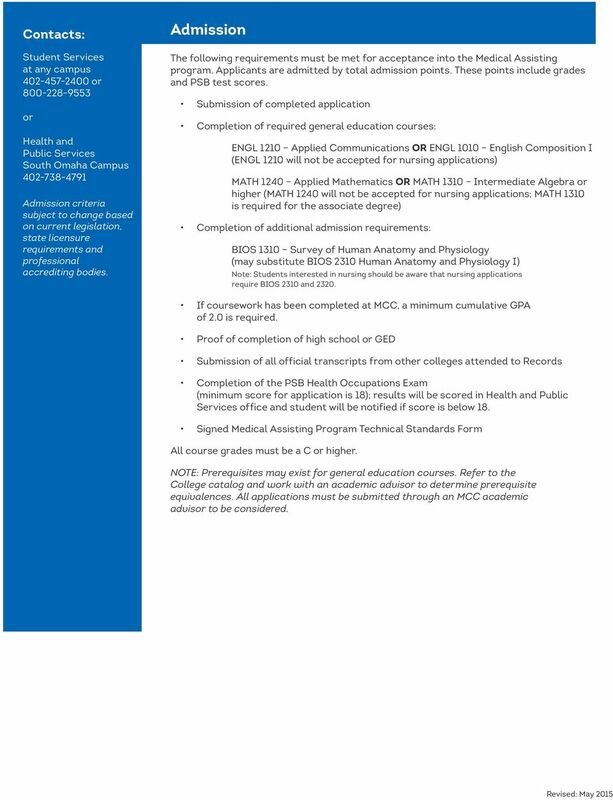 mccneb.edu/healthpublicservices End of July Fall quarter Format Evening classes Day classes Accepted 20 students 20 students Admission process Within 30 days of the application deadline, all applications will be reviewed. Applicants are notified of admission status by U.S. mail. Applicants must be a minimum of 18 years old to apply. 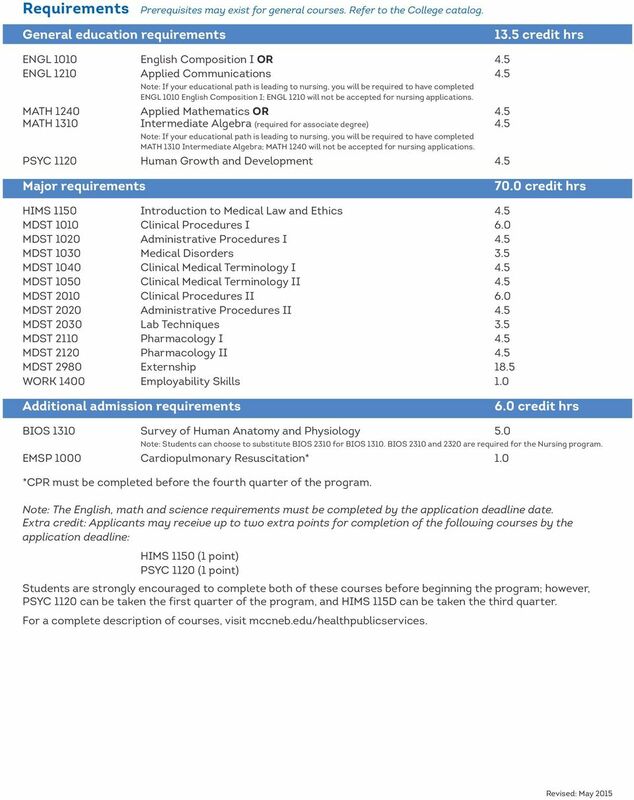 Applicants determined to be eligible for admission will be ranked according to the following factors: The applicant s GPA of the pre-entrance courses as of the application deadline Completion of the PSB Health Occupations Exam (exam score will be calculated by a formula to arrive at the PSB value points). Minimum score of 18 is needed for application (based upon raw scores). Completion of all admission requirements and program application by the application deadline date Mandatory orientation attendance Proof of immunizations Final admission will be based on receipt of completed background/abuse check and drug screening. Details regarding types of tests and approved vendors will be provided upon admission acceptance. 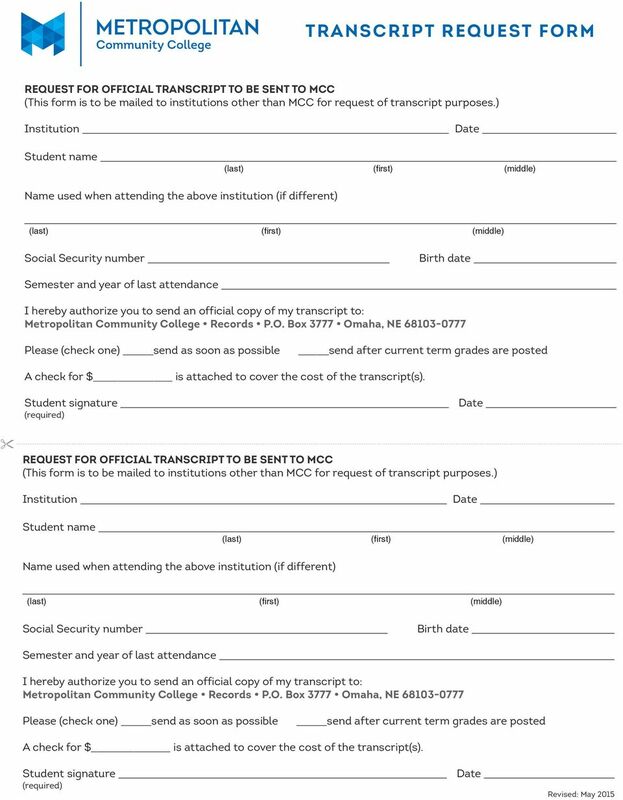 Students must meet with an MCC academic advisor to complete their application process. Admissions note: Submission of application does not guarantee acceptance. 2 Requirements Prerequisites may exist for general courses. Refer to the College catalog. General education requirements 13.5 credit hrs ENGL 1010 English Composition I OR 4.5 ENGL 1210 Applied Communications 4.5 Note: If your educational path is leading to nursing, you will be required to have completed ENGL 1010 English Composition I; ENGL 1210 will not be accepted for nursing applications. MATH 1240 Applied Mathematics OR 4.5 MATH 1310 Intermediate Algebra (required for associate degree) 4.5 Note: If your educational path is leading to nursing, you will be required to have completed MATH 1310 Intermediate Algebra; MATH 1240 will not be accepted for nursing applications. PSYC 1120 Human Growth and Development 4.5 Major requirements 70.0 credit hrs HIMS 1150 Introduction to Medical Law and Ethics 4.5 MDST 1010 Clinical Procedures I 6.0 MDST 1020 Administrative Procedures I 4.5 MDST 1030 Medical Disorders 3.5 MDST 1040 Clinical Medical Terminology I 4.5 MDST 1050 Clinical Medical Terminology II 4.5 MDST 2010 Clinical Procedures II 6.0 MDST 2020 Administrative Procedures II 4.5 MDST 2030 Lab Techniques 3.5 MDST 2110 Pharmacology I 4.5 MDST 2120 Pharmacology II 4.5 MDST 2980 Externship 18.5 WORK 1400 Employability Skills 1.0 Additional admission requirements 6.0 credit hrs BIOS 1310 Survey of Human Anatomy and Physiology 5.0 Note: Students can choose to substitute BIOS 2310 for BIOS BIOS 2310 and 2320 are required for the Nursing program. EMSP 1000 Cardiopulmonary Resuscitation* 1.0 *CPR must be completed before the fourth quarter of the program. Note: The English, math and science requirements must be completed by the application deadline date. Extra credit: Applicants may receive up to two extra points for completion of the following courses by the application deadline: HIMS 1150 (1 point) PSYC 1120 (1 point) Students are strongly encouraged to complete both of these courses before beginning the program; however, PSYC 1120 can be taken the first quarter of the program, and HIMS 115D can be taken the third quarter. For a complete description of courses, visit mccneb.edu/healthpublicservices. 3 Contacts: Student Services at any campus or or Health and Public Services South Omaha Campus Admission criteria subject to change based on current legislation, state licensure requirements and professional accrediting bodies. 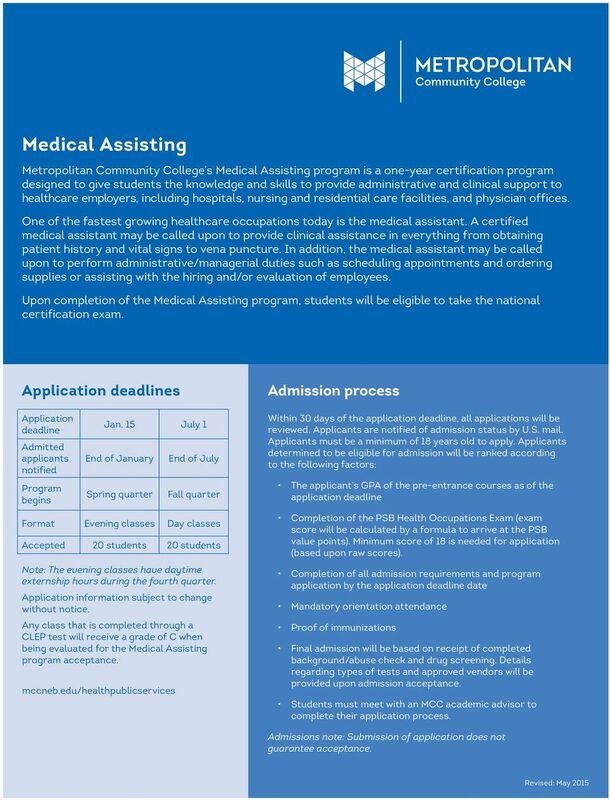 Admission The following requirements must be met for acceptance into the Medical Assisting program. Applicants are admitted by total admission points. These points include grades and PSB test scores. Submission of completed application Completion of required general education courses: ENGL 1210 Applied Communications OR ENGL 1010 English Composition I (ENGL 1210 will not be accepted for nursing applications) MATH 1240 Applied Mathematics OR MATH 1310 Intermediate Algebra or higher (MATH 1240 will not be accepted for nursing applications; MATH 1310 is required for the associate degree) Completion of additional admission requirements: BIOS 1310 Survey of Human Anatomy and Physiology (may substitute BIOS 2310 Human Anatomy and Physiology I) Note: Students interested in nursing should be aware that nursing applications require BIOS 2310 and If coursework has been completed at MCC, a minimum cumulative GPA of 2.0 is required. 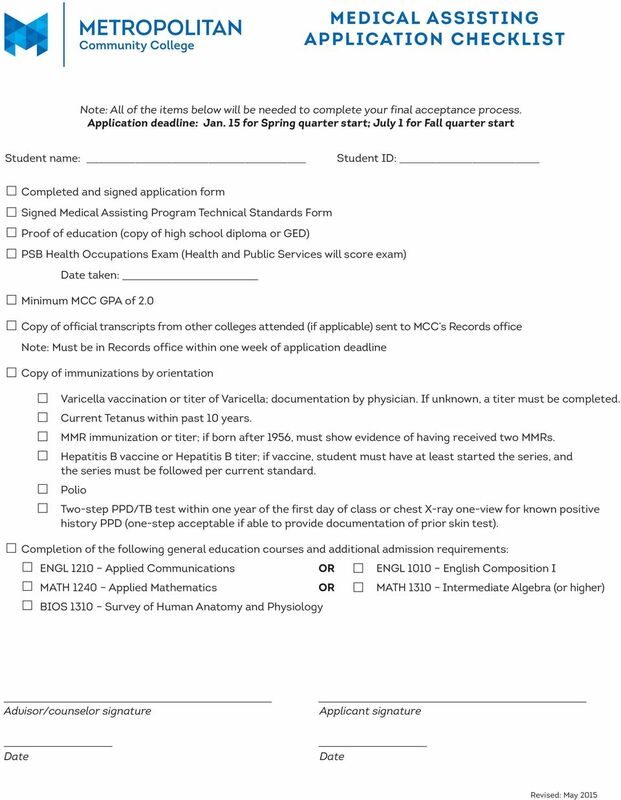 Proof of completion of high school or GED Submission of all official transcripts from other colleges attended to Records Completion of the PSB Health Occupations Exam (minimum score for application is 18); results will be scored in Health and Public Services office and student will be notified if score is below 18. 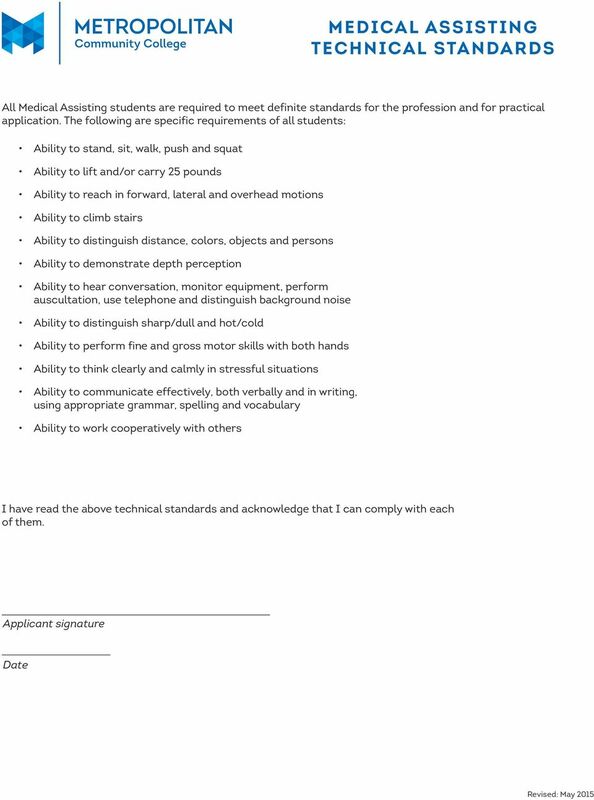 Signed Medical Assisting Program Technical Standards Form All course grades must be a C or higher. NOTE: Prerequisites may exist for general education courses. Refer to the College catalog and work with an academic advisor to determine prerequisite equivalences. All applications must be submitted through an MCC academic advisor to be considered. Enrollment is limited. Consult the HDIM website for application dates. (To locate the HDIM website, search for HDIM from the MCC home page.